Marc Gomez just sent in very interesting article about his SAT tonearms and general design aspects... "I have recently launched two new series of arms, each of them with a 9 inch and a 12 inch version. As there are an increasing number of discussions going on about the benefits and superiority of one arm length compared to the other, as well as my chosen alignment, I want to clarify these subjects in this paper." "My own SAT arm models are used as examples for the explanations, but the ideas discussed apply to all arm designs in general." Firstly, the arm is a mechanical device which main tasks are to hold the cartridge steadily centered in the groove and at the same time allow it to move, following the spiral geometry of the groove as the record is played, as well as coping with the imperfections all records show to some extent - warps and eccentricity. The function and performance of an arm is therefore best analysed by its behaviour from a mechanical point of view, as a mechanical precision instrument rather than a musical instrument. My design approach with the original SAT Pickup Arm has been to analyse the physics of the interaction between the stylus and the record, from that, derive a set of requirements for the arm, convert them into a set of specifications and finally implement them into a design. While it is impossible to see with the naked eye, the cartridge and arm components deform at microscopic levels while playing a record. This can be measured with accelerometers, laser vibrometers and simulated by finite element analysis. The displacement of the stylus, forced by the groove, causes a deflection on the cartridge suspension. This generates a mechanical load on the cartridge which is transmitted to the arm - this load is constantly changing in level and direction, modulated by the groove. The loads are small but more than enough to affect the tiny components of the cartridge and the arm, forcing them to bend and twist. It is fundamental to understand that every relative movement of the stylus with respect to the cartridge body will generate a signal - it doesn’t matter whether the movement comes from the stylus or the cartridge. If that movement is purely generated by the displacement of the stylus in the groove, then we are getting a read of the music, exactly what we want. When the cartridge body moves, not just at a macroscopic level but at the same microscopic levels of the groove modulations, that also generates a signal, though in this case, it doesn’t correspond to the information in the groove and is therefore distortion. All bodies deform under the effect of a load - a force, a torque, a pressure, etc. As the cartridge is so sensitive to minuscule movements, at such small levels that are actually difficult to grasp, even the smallest deformation of the cartridge components and the arm will generate a false reading of the groove and therefore distortion. The more the components deform, the less accurate will be the groove reading and the sound quality will suffer. We are talking about deformations in the order down to nanometers (1/1.000.000 of a millimetre). It is then obvious that any engineer would want to design this groove-reading devices as rigid as possible in order to reduce the detrimental deformations. That wouldn’t be any problem if the arm didn’t need to allow the cartridge to follow the warps and eccentricities - we could then use a very big, massive structure and have deformation levels orders of magnitude lower than with current designs. Unfortunately, we need to deal with record imperfections and the limitations that the cartridge suspension imposes on how massive an arm can be. This is why designing and building a truly high performance pickup arm is such a demanding task - two main opposing requirements must be met: very high rigidity and very low resistance to free movement in the vertical and horizontal planes. The moment of inertia of an arm, which is related to what is usually called effective mass, represents a measure of how much resistance to initiate a rotating movement the arm has. An arm with low moment of inertia will react quickly to wraps and eccentricities, while a high moment of inertia will make the arm more sluggish and deflect the cartridge suspension more. The laws of physics dictate that, due to the loads an arm is subjected to, a shorter length has a higher potential for rigidity and lower moment of inertia. Given an arm tube with a certain length, diameter, cross-section and material, when the length is doubled the bending and torsional stiffness will decrease to half. In the same example, the moment of inertia will increase to 4 times the original one. To bring the stiffness of the 12 inch arm tube to the same levels as the 9 inch version, one must add material which will substantially increase the moment of inertia. Given a certain maximum moment of inertia allowed as design specification, I can always design a 9 inch version with much higher stiffness - every single time - no matter what kind of design the arm tube has. Arm design is a technical subject and require the use of accurate technical terms in order to reduce the risk for misinterpretations. Many are mixing the terms vibrations and resonances to refer to two different phenomena, though they are related. All bodies vibrate at their own natural frequencies and modes when excited, as well as their harmonics (multiples of the fundamental frequency). A longer and less stiff body will start vibrating from a lower frequency while a shorter and stiffer body will start vibrating at higher frequencies. An arm tube vibration is mainly caused by the loads generated on a cartridge suspension. As this cannot be avoided, what matters is at what frequencies and, most importantly, with what amplitude the vibrations occur. The higher the amplitude the more detrimental the effect will be for reproduction accuracy. Resonance occur when the frequency of the exciting load is the same as one of the natural resonance frequencies. This is an undesirable condition as the amplitude of the oscillations will be much higher than at other neighbouring frequencies. This will cause an increase in distortion. 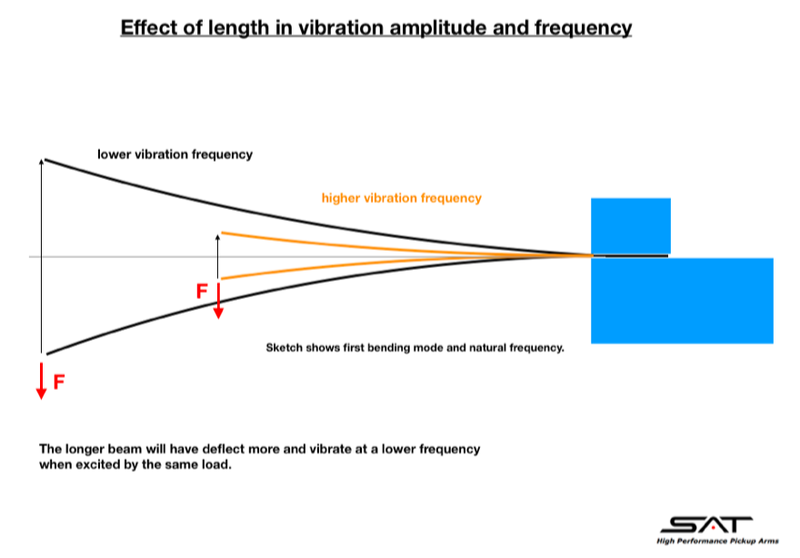 The higher the fundamental resonance frequencies of the arm’s components (headshell, arm tube, bearings, etc...), the lower the amplitude of the vibrations and the less amount of harmonics will be within the audio frequency. A very familiar example of change in natural frequency is the behaviour of a ruler hold against the edge of a table; if we let 50cm of ruler overhang from the table and bend it, it will start vibrating at a certain frequency when we release it. If we now let just 30cm of ruler overhang from the table and do the same, it will vibrate at a clearly higher frequency and with smaller amplitude. The shorter ruler is more rigid and therefore has a higher natural frequency of vibration with less amplitude. Exactly the same principle applies for an arm tube. It is important to notice that, in the case of an arm tube, I am here referring to vibrations with an extremely small amplitude that are deforming the tube at a microscopic level - nothing to do with the macroscopic movements of the arm tube caused by warps and eccentricities. That is a different phenomena. I design the arm tubes of the SAT arms to be very rigid and have very low resonance amplitude at as high a frequency as possible. The CF1-09 arm’s tube - the most rigid tube in the SAT range - has its first and second natural resonance frequencies at 4030Hz and 9000Hz, respectively. In comparison, the CF1-12 tube’s natural frequencies are 2380Hz and 5800Hz. Under the same loads, the longer tube will start vibrating at a lower frequency and with higher amplitude. The next relevant subject is the tracing error and distortion related to it. With a properly setup cartridge in a 9 inch arm, using the traditional alignments, the maximum angular error and associated distortion are very small - typically under 1,5 ̊ and 1% distortion. Increasing the length to 12 inch provides a 20-30% decrease in the error, which seems as a big improvement in percentage. Nevertheless, as the original error is already very small, even a 30% improvement will be a very small one in absolute terms. Most of the owners of record players never check the mounting position of the stylus on the cantilever viewed from below, and even less compensate for that. Suppliers of cantilever assemblies usually specify a tolerance of a few degrees for the position of the stylus on the cantilever, due to the manufacturing process - units within that tolerance are considered good. For the end user, it is impossible to spot that without a microscope. This deviation will induce a tracing error and distortion far greater than the improvement brought by using a longer arm, negating the benefit of it - going from 9 inch to 12 inch gives a typical maximum improvement in angular error of around 0,5 ̊, compared to a typical tolerance of stylus mounting position of ±2 ̊. Furthermore, adjusting the position of the cartridge to within 2 ̊ is a task most users are not able to perform. The very small reduction in the absolute tracing error associated from going from a 9 inch to a 12 inch arm is marginal compared to the much greater potential for improvement in terms of rigidity and its associated distortions, in a properly designed 9 inch arm. As opposed to the distortions generated by the angular error, which vary from 0% to 1-2% in a very progressive and slow manner while the cartridge traces the arc from the outer groove to the inner groove, the effects caused by the lack of rigidity of the arm are constantly at play and are of a different nature. Therefore the benefits of a stiffer arm will be noticeable and effective through the whole record, while the improved angular error of a longer arm will be mainly noticeable in small portions at the end, the center and the beginning of the record. One of the most important advantages of a rigid arm is that it will reproduce the transients of the music better as it will not deform as much by the sudden peak in the load coming from the cartridge. In the same way, all the micro details of the music will be better retrieved by an arm that is deforming less. The overall resolution across the whole frequency spectrum is increased. 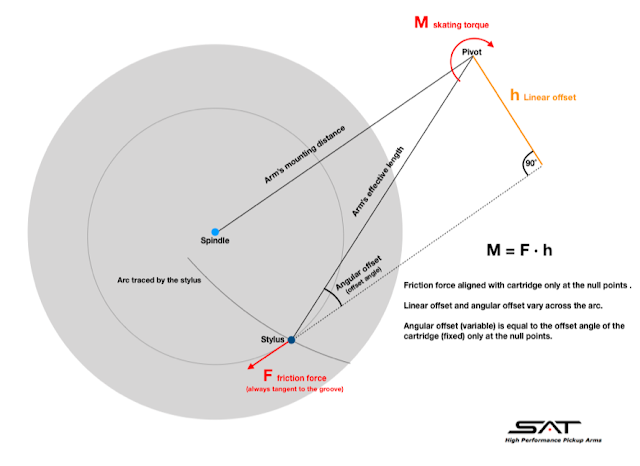 The alignment that I use for the SAT arms is based on the Löfgren equations conventionally used by many other manufacturers. Although most manufacturers calculate their geometry based on different recording association standards for values of the groove innermost and outermost radii, I opted for another set of values that better represents the vast majority of real-world 12” LP records produced, based on my own measurements. The values given by the standards are limit values and most recordings never go that far into the record. I specified the outer radius to be 143mm and the inner radius 75mm. This gives a somewhat higher angular error at the portion of records with musical content from 75mm and inwards, and at the same time, a consistently lower angular error than with other traditional alignments in the area between the led-in groove and 75mm. This is a conscious choice to enjoy a lower angular error than with most traditional alignments in all but a few tracks of a typical record collection. The null points for the SAT arms are located at 80 and 126mm. Ultimately, this was a choice of enjoying a consistently higher level of fidelity for 95% of the time over having less angular error on 5% of the tracks. 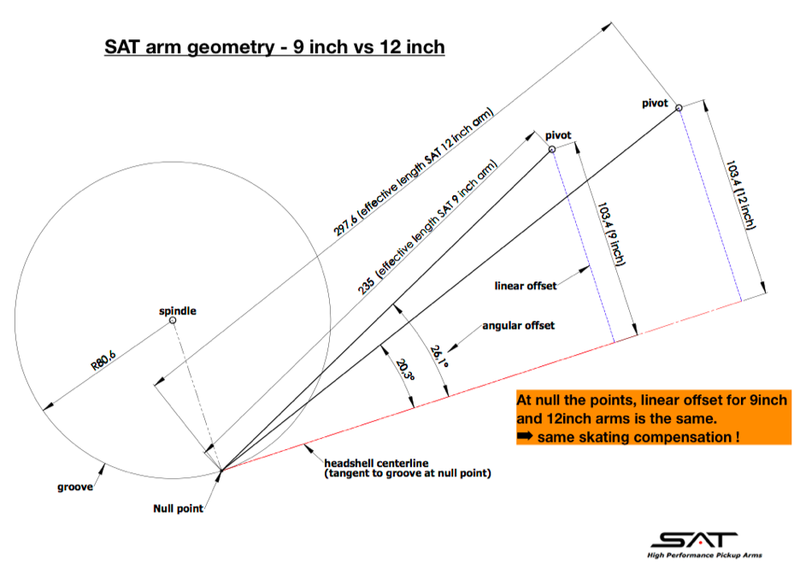 Many supporters of the 12 inch arms claim that one of the benefits of a longer arm is that, as the angular offset in the alignment is lower, the skating compensation needed is lower too - they see this as a positive side effect. This is one of the most unsubstantiated claims in vinyl playback that needs to be debunked once and for all. In pivoted arms, the skating compensation is applied as a torque around the axis of rotation in the horizontal plane. This torque has to be equal and of opposite direction than the torque created by the friction force of the stylus on the record multiplied by the linear offset, which is related to the angular offset by the effective length of the arm. For the same kind of alignment and keeping the same null points, the friction force at the null points is the same for a 9 inch and a 12 inch arm. The linear offset is also the same in both cases, as even if the angular offset decreases for a longer arm, the effective length also increases, bringing the linear offset to the same value as for any other length of arm. Therefore, at the null points, the skating compensation should be the same for any length of arm. Outside the null points, the compensation torque will vary typically ±3% of the nominal value at the null points for a 9 inch arm and ±2% for a 12 inch arm, due to geometric changes - following the same variation as the angular error. This is such a small change that it is best to be accurate with the nominal value, keep it as constant and consistent as possible across the arc and not worry about that small variation. 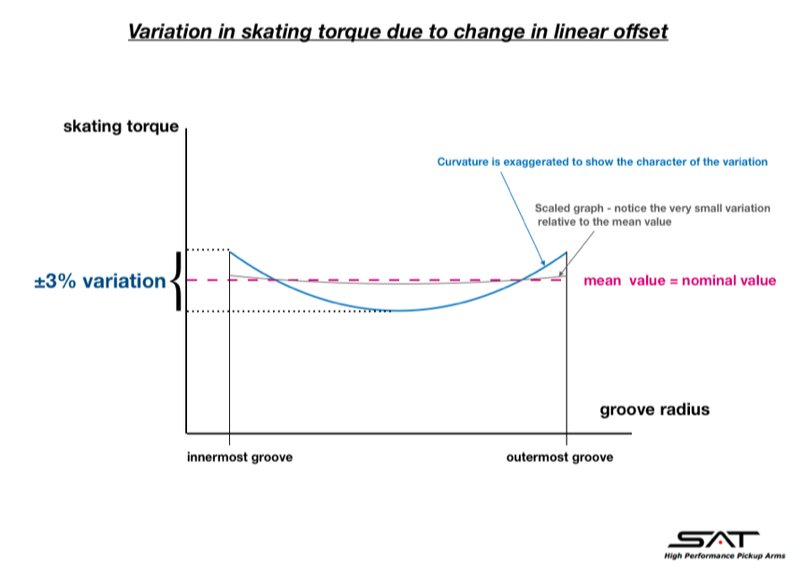 No other factors that might affect the friction force are considered in this ±3% variation, simply because they are unpredictable and not properly quantified yet, like groove modulation. To accomplish this, I designed a constant-torque anti-skating device with two pulleys with very low friction, a super-fine thread and a weight. Simple, 100% accurate, repeatable and reliable. For all the above reasons, I chose to design the original SAT Pikcup Arm as a 9 inch model instead of a 12 inch one. After three years of production, and taking advantage of the launch of the new CF1 and LM series of arms, I decided to add a 12 inch version for each of the lines. This decision was driven by the request from some of the exiting owners to be able to have an additional SAT arm that could be mounted on a position or a turntable where a shorter model wouldn’t fit; I also wanted to give the opportunity to experience the SAT performance levels to those who feel a 12 inch is a better choice, based on their preferences. As physics hasn’t change since I developed the original SAT Pickup Arm, for a given moment of inertia, the shorter arms provide in general a more accurate sound reproduction - which is not to say many might prefer the sound of the 12 inch versions. I have intentionally not changed the basic design of the 12 inch models and created something different; they are clearly based on the 9 inch versions, with some changes required to compensate for the different mass distribution. Whatever design changes I would make on the 12 inch models to improve rigidity, I could also make on the 9 inch models - it doesn’t make sense to make them compete with each other. The differences will always be there and are dictated by physics. Both the LM-12 and CF1-12 models have a consistent different sound when compared to their 9 inch siblings. It all can be explained by the physics of their design and how they interact with the cartridges. At the same time, the original SAT Pickup Arm and all four new models share a common sonic identity, with very high resolution, low distortion and precise transient response, at the highest levels available today.